One of the more popular sports in the world, basketball has representation in many countries. With a World Cup, Olympic Games and of course the ubiquitous NBA, basketball is as far reaching as just about any other sport. Few sports have the worldwide appeal of the NBA, with the allure of emulating the feats of LeBron, MJ and Kevin Durant — as well as the ever-growing popularity of wearing the jerseys around town; the NBA is without a doubt one of the coolest sports on the planet today. The NBA is the most popular basketball competition to bet on too. In season there can be up to 10 games on in a day, and more often than not every day of the week will have at least two or three matches. Because of this, NBA is fast becoming one of the most gambled upon sports in the world, due to the frequency of games, excitement of the product and the multitude of options available to the investor. In Australia the biggest basketball competition is the NBL which has produced many global stars of basketball, with pioneers like Andrew Gaze and Shane Heal inspiring young talent like Dante Exum, Andrew Bogut and Ben Simmons. When it comes to placing a bet on the basketball, there will be no shortage of avenues in which to invest your money, but if you want to do it the right way there are only a few choices you should go with. Aside from the typical head-to-head and line betting markets, the NBA and other leagues offer a plethora of options for those punters looking to make exotic investments on basketball. Title winner, Conference champion and MVP betting are some of the long-range bets you can make, but if you are after a short-term, game-time type of bet, online bookmakers offer daily top-scorer bets which pits up to six players against one-another from different games to see who ends the day with the highest score. Specific bookies such as Sportsbet offer Daily powerbets which usually include a player reaching a certain game milestone, coupled with their team winning. The bookie will offer enhanced odds if the outcome of the designated bet is successful. Most Australians are familiar with the NBA and the NBL, but we have plenty of other competitions that will have odds provided on them by respected online bookmakers. This means we can wager every day of the year on the various competitions around the world. The National Basketball League has been Australia’s premier professional basketball competition since its 1979. The competition has experienced its highs and lows in terms of popularity, but certainly reached its peak in the 80’s and 90’s before a quiet period in the 2000’s. A revitalised NBL has made its way back into the national spotlight for all the right reasons since 2014, attracting international talent, nurturing local stars and gaining lucrative television and media deals. Australia’s interest in basketball has coincided with a number of local stars making the grade overseas. The Perth Wildcats were the 2016 NBL Champions, winning the 5-game finals series in three-straight games over the Illawarra Hawks to clinch the crown. The Australian Opals – our national women’s team – put the WNBL on the map with a string of massive performances at events like the World Championships and the Olympics – where we have often been bridesmaids to the USA. The competition runs from October through to March the following year and features eight teams from right across Australia. Sydney Uni Flames are the reigning WNBL champions after defeating Dandenong Rangers 2-0 in the playoff series. The prior two seasons were taken out by Townsville, while Bendigo won the 2012-13 and 2013-14 seasons. Some of the greatest Australian female players include Lauren Jackson, who recently retired after a decorated international career, Liz Cambage, who was the no.1 draft pick in the WNBA and the long retired Michelle Timms, who is still a prominent figure in the Australian basketball scene. The emergence of Irving ‘Magic’ Johnson: Few players in the game have reached the name recognition of Irving ‘Magic’ Johnson, and his performance in the 1980s finals for the LA Lakers – specifically game six solidify why the man is amongst the greatest to ever take to the court. A 20 year old rookie at the time, Magic put on an unprecedented finals performance that has not been matched since: 45 points, 15 rebounds and seven assists. The Lakers would go on to win five titles in the 80s, stamping themselves as one of the best teams of all-time and Magic as one of the greatest NBA players in the sport’s history. LeBron overcomes his demons to crush the Celtics: Few players have polarised the sport of basketball more than LeBron James. 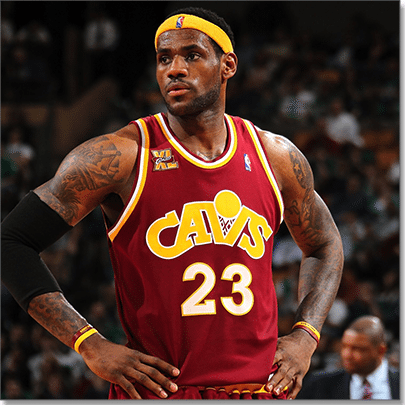 The man they call the King did all he could to get his native city of Cleveland its maiden title, but it never eventuated, with a long-standing rivalry with the Boston Celtics – their Eastern Conference foes – getting the best of the King, who could never seem to find his best form when it mattered most against the Cs. Fast forward several years later, with the King now in Miami, but again starring down the barrel of a Eastern Conference series defeat against the Celtics who led 3-2, LeBron overcame his opponents and his own demons to record one of the great playoff performances of all-time, dropping 45 points (on 19-of-26 shooting), grabbed 15 rebounds and handed out five assists. It was the coming of age the King needed to prove he had what it took to perform when it truly mattered. The Heat would go on to beat the Oklahoma City Thunder in the Finals – with James named Finals MVP. Michael Jordan’s flu game: It is hard to pick just one moment of a glittering Micheal Jordan’s career, but MJ’s infamous ‘flu game’ in 1997 where he battled not only his opponents the Utah Jazz, but a debilitating illness proved that not only was Mike one of the most skilled players to ever take to the court, but had the mental fortitude to match. Jordan was so sick and lethargic that he needed his teammates’ assistance to get from the floor to the huddle for timeouts. An illness that would leave most athletes absolutely floored did nothing to quell the influence of MJ, who torched the Utah Jazz to the tune of 38 points, handing the Bulls a 3-2 lead in the series. Reggie Miller scores eight points in 8.9 seconds of game time: Before Reggie Miller was an ESPN analyst, the former Pacer personified the phrase ‘you either love him or hate him’ – and few franchises in sports history hated Miller more than the New York Knicks. The venom from both player and crowd reached a crescendo in game one of the 1995 Eastern Conference finals when the Knicks fan-base, and specifically die-hard Knick and famed director Spike Lee taunted Miller relentlessly through the match, and it seemed to get in the heads of the Pacers – but not Miller. The Knicks controlled the match and seemed to have it in hand towards the end of the game, with the Pacers needing to make up a six-point deficit in the final 18.7 seconds to win the game. Miller put on a scoring display in the last moments of the match that will go down as one of the most dominant in the NBA’s history, and not one to miss an opportunity; Miller’s final shots – two free throws – were nailed with consummate ease, taunting the crowd while doing so. Miller would end the game with 31 points, the Pacers would complete the unlikely victory and go on to win the series in game seven. Ray Allen’s clutch three-pointer against the Spurs: Each of the preceding moments in this list have included huge stat lines and magnificent game-long displays, but few can live up to the drama and exquisite skill execution quite like Ray Allen’s game-tying three point shot for the Heat against the Spurs in game six, 2013. The Heat were facing home court elimination, down by three points with less than 20 seconds to go, LeBron James – the Heat’s designated big shot taker – fires up a three that rims out, teammate Chris Bosh secures the rebound and kicks it out to Ray Allen, who, in a moment of sheer brilliance both in court awareness and calmness under immense pressure, finds the three point line and nails the shot to tie the scores. Few would even know Allen’s ending box-score (shooting only 3-8 from the field), but his shot will forever go down in NBA folklore as one of the greatest clutch shots in the sport’s history. The Heat went on to win game six 103-100, and eventually the series. Most websites have multiple options for you to deposit your money. Credit card: The most popular method of deposit and is available on every Australian sports betting website. All transactions are secure and money can be transferred to and from your card once your account is verified. Poli bank transfer: Australia’s most popular real time debt payment system. Money is debited from your account and transferred straight into your online bookmaking account. Paypal: One of the world’s most popular online spending systems and is the largest online payment companies. Paypal offers users who either have a credit card or a bank account linked to their Paypal a third party way of depositing their money into their betting funds. BPAY: BPAY debts work exactly the same as you would pay a utility or phone bill, however, depending on when the transaction is completed the money can be delayed going into your account. Each website will have its own unique BPAY transaction number and biller code. Due to restrictions on live betting in Australia, customers are unable to bet on basketball via their PC, tablet or phone once a match has commenced. However, options still exist for those wanting to place a live bet. All major online bookmakers have the option to call in and place a live bet. With Australians mad about the NBA and NBL pay-tv provider Foxtel holds the TV rights, plus one free-to-air game of NBL is shown each week across Australia. Other options to watch various basketball leagues include league passes and streaming services which you can read about here.